For the second consecutive year, a Soto student has been selected for the prestigious Posse Scholars program, which provides a four-year, full-tuition scholarship. 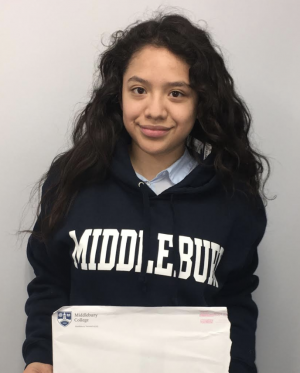 Soto senior Ericka Perez will attend Middlebury College in Vermont. Ericka is a member of the National Honor Society and assists with after-school tutoring for SAT test preparations. She has previously participated in the Girls Who Code program and the FLIP-Urban Planning program. She is the second Acero Schools student to earn a Posse Scholarship to Middlebury. Last year Garcia senior Luis Daza was selected for the Middlebury program and Soto senior Maelvi Nunez was selected to attend Pomona College in California. Soto Principal Kelly Smith spoke with Maelvi last week and reports that she is doing really well thanks in part to all the support provided by the Posse Organization. The Posse program identifies students with academic and leadership potential and sends a group to a school together as part of a “posse” to support and back each other up. In the months before they start college, the scholars meet weekly with Posse peers and staff for workshops to help prepare them for the transition to college. At college they are paired with mentors and the Posse staff visits the campus regularly and facilitates retreats. As a result of this strong support, Posse Scholars persist and graduate at a rate of 90 percent and are known to make a visible difference on campus and throughout their professional careers. Sanober Kanjee, college counselor at Soto, says that students are made aware of scholarship opportunities and deadlines through weekly presentations on “College News”, and mass class e-mails.